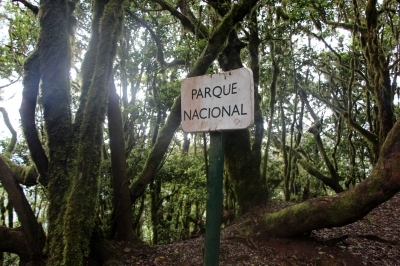 Garajonay National Park contains the best example of laurisilva, a humid subtropical forest that in the Tertiary covered almost all of Europe. The park is located in the center and north of the island of La Gomera, one of the Canary Islands. The forests are made up of laurel-leaved evergreen hardwood trees, reaching up to 40 meters in height. Many of the species are endemic to the islands, and harbor a rich biota of understory plants, invertebrates, and birds and bats, including a number of endemic species. Garajonay is renowned as one of the best places to observe the two Canarian endemic pigeons, Laurel Pigeon (Columba junoniae) and Bolle's Pigeon (Columba bollii). Spain’s Garajonay National Park only has a small footprint on the web. In preparation of my visit, I had been looking for a few extra links to upgrade the site’s page on this website. But not many people seem to go there or at least write about it. It’s not popular among World Heritage lovers either: it’s ranked 409th out of 481 European WHS in our listings. The park covers the central part of the Canary Island of La Gomera, which is the neighbouring island to Tenerife. 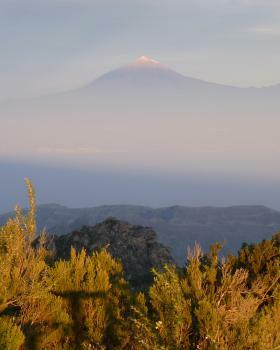 Tenerife’s prominent WHS Teide volcano can be seen well from the Garajonay. Garajonay’s claim to fame is its laurel forest. At its inscription as a WHS in 1986, this Spanish national park was seen as the best preserved stretch of laurisilva that once covered all Canary Islands and Madeira. 13 years later the similar Laurisilva of Madeira was admitted to the WH list. Its nomination document goes a long way to describe the differences: the Madeira laurel forest WHS is about 5 times larger than the one on Gomera, and the forest “is in general more luxuriant than the Canarian forest, being taller, wetter and cooler.” They claim that the Madeiran forest was just lesser known and written about in the 1980s than the Canarian ones. So maybe Garajonay’s value isn’t that outstanding after all. Interisland rivalry aside, something with an enormous impact happened to Garajonay in 2012: a forest fire burned 3,000 hectares (20%) of this national park. During my visit two years later, the effects were still very prominent. I started with an ascend to the top of Garajonay mountain, and noticed blackened trees all around the summit. An information panel at the top describes how succesful the conservation in this national park has been in the 1980s, by eradicating all foreign trees (such as eucalyptus). A final note has been added about the fires: optimistically they point out to see and look how quickly the forest recovers. My eyes however tell me that tree heath regrows much quicker than laurel forest. To see as much as possible of Garajonay National Park in one day, I hiked for 10km along its “roof top”, a circular walk from Laguna Grande to the top of Garajonay. The mountain top itself is a popular tourist stop, a 30-minute uphill walk from the main road. Here you can find the great views on the surrounding islands such as Tenerife and Gran Canaria. The rest of the hike fortunately was much more quiet. I had prepared for a cool cloud forest, packing a sweater and a soft shell jacket. But due to the fires, the paths now lie out in the open. Even in late December the sun in this part of the world is strong. Also there seems to have been little rain recently. Only during the last 2 kilometers of my hike, near Laguna Grande, I saw some of the features that I had anticipated: lush vegetation, mosses and lichens. Still much less of those than I saw on (the wetter) Madeira and certainly on the ultimate wet forest Yakushima. 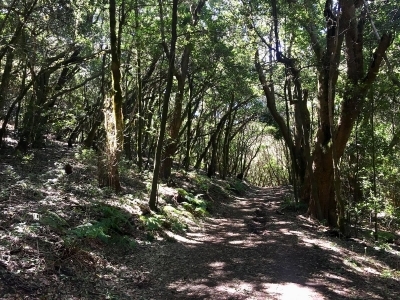 Although La Gomera sees its fair share of tourists, it still is somewhat of an adventure to get to Garajonay. There are only a handful of buses a day, and on "my" bus people were left at the bus station of San Sebastian de la Gomera because the bus was full. And when you finish your visit, you can only hope there will be a return bus. Otherwise you’ll have to hitchhike. I missed my return bus too, and got picked up by a shark-like taxi driver who cruised past the bus stop just after the bus had left. The park can be visited on a rather easy day trip from Tenerife. I took the 08:45 ferry from Los Cristianos (50mins) and went back on the 17:30 ferry. The price of about 30 Euros per way was ridiculously high. At La Gomera port I rented a car for 25 Euros. Got it in about 2 minutes. Easiest rental ever. From the port it’s a rather joyful uphill drive to the park. You could follow routes that take the whole day. I opted for driving to several viewpoints instead and did a few kilometers return on several path. If you are not a total tree enthusiast, a trek for several hours will get boring. It’s a constant up and down between the ever same trees. My favorite viewpoints were the Miradores del Rejo and Hermigua. You will need to walk for a few minutes from the parking but views are nice. There is not much else to see on the island. The “capital” is tiny even tough with a nice church and a park with a tower from colonial times. Further, I visited Agulo, a rather small and unspectacular village. Not really worth the effort. The intention behind our recent trip to Tenerife was twofold: enjoying some sunshine at the end of our first European winter, plus naturally visiting the World Heritage Sites on Tenerife and the adjacent La Gomera island. Organising our visits to the sites actually on Tenerife were easy, but it proved to be a bit tricky when it came to visiting Garanjonay National Park on La Gomera. Our tentative plan was to take the ferry over, spend a day exploring, stay the night, then return the next day before our flight out of Tenerife South airport in the afternoon. However, firstly, there's virtually no hotels or Airbnbs on La Gomera that allow dogs (as we were travelling with our dog, like usual). We could have made do with the rustic options open to us, but then we realised a second issue. We wanted to hire a car for a day (not take a car across from Tenerife). But my husband these days only drives an auto, and we couldn't find a single auto car rental available on La Gomera. We knew there was a bus option, but after reading previous reviews weren't happy to depend upon it. Luckily, we found an alternative. 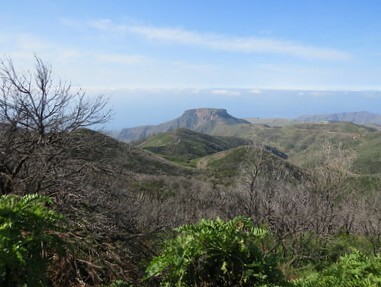 On GetYourGuide, we came across a day trip option: "La Gomera Full-Day Hiking Tour from Tenerife". Unlike most of the other day trips that mention "visiting the national park", but just drive through the park on a bus, this tour mentioned hiking in the national park. Plus, the cost of the tour was barely more than the price of the (expensive) ferry trip. Normally we avoid organised tours, but this was perfect. The tour and our visit to Garanjonay National Park ended up being a great day. The tour is bi-lingual, with a German guide, who provided information in both German (for the majority of the group) plus English. On our hike, we firstly hiked on the "Las Creces" path through the heath forest, then next to a spectacular section of canyon, just outside of the national park on the dryer side. a. We gave La Gomera island 2 days/1 overnight in early Dec 2015 – I am sure that those who enjoy walking holidays could (and do) spend much longer but we found this was long enough to see both the NP and the island highlights. You could tick the NP off (even including a walk) in a single day return by ferry from Tenerife but that would be very rushed having spent the money to get there! b. Although (as per Els above) you could rely on Taxi/Bus, my view is that car rental is particularly worthwhile given the scattered nature of the sights around the island and the frequency/routing of busses. It is not as cheap as on Tenerife (We paid 50 Euro for 2 days inc full CDW) but not bad. All the international, national and local rental agencies are located at the small ferry terminal at San Sebastian. Having left Los Cristianos on Tenerife at 9 am on the fast ferry, we arrived at 9.50 and were “on the road” at 10.05 with a pre-booking. c. The main NP visitor centre is outside the NP in the north of the island (the NP calls it the “area Pre-parque”!). See this map top right. The exhibits of geology and nature are a little old but we found the ethnological section in the so-called “House of Memories” well worth a visit - primarily for a video about various aspects of life on, and history of, Gomera (The Silbo “whistling language”, the “Salto del Pastor” pole leaping, palm honey, terrace construction, guanche “wheel-less” pottery etc etc). A spanking new centre is being built just down the road (see link). Its Canarian architect also designed the nearby “Abrante lookout” set 620m asl with stunning views over the village of Agulo and beyond). a) Cultural property. Criteria being examined by ICOMOS. followed solely by IUCN’s evaluation on Natural criteria. So it appears that Spain actually nominated the site on mixed criteria – presumably because of its Guanche archaeological remains but the Cultural aspect got dropped at the time of evaluation. However, I have been unable to find any reference to any evaluation by ICOMOS so can’t be 100% sure. e. The NP certainly does have Guanche burial caves and ceremonial altars within it which could have justified such a nomination but, as far as I could discover, none of these are accessible or much publicised though some of the caves can be seen on exposed rock faces- they certainly seem to provide thin justification for a mixed site! At the summit of Alto de Garajonay there is a reconstructed shrine (said to be situated over the original) - but that is all we saw of Guanche “remains” in the NP. f. You are going to have to decide which walks (if any!) you want to do in order to experience the NP beyond the road. We decided that we “needed” to see a range of the different climatic, and hence botanical, zones so chose 4 (numbered on the map above) to do in part. The weather across our visit was partly sunny with some passing cloud – in some respects we were lucky in this but I guess we did fail to experience the NP in all its misty glory! i. No 3 – from the main parking/restaurant area at Laguna Grande hardly justifies the word “walk” – more of a stroll really, but it does provide a signed introduction to a number of tree and plant species. The rest of the NP only has signs at the route entrances but there is an App downloadable from the NP Web site (which unfortunately we didn’t have!) with explanations accessible via dot codes fixed to small posts accessed via your camera. iv. No 2 - takes in a deep “ravine” area with running stream (rare on la Gomera) and thicker taller trees. We were quite amused to hear a conversation of marital disharmony from a couple we passed in which the lady complained to her partner that the walk was “cold, damp and boring”!! Well, we thought it was a long way short of any of those but it was true that, once one had seen a few tens of thousands of trees and a lot of moss etc, there didn’t seem a great incentive to continue much further! I guess that we are “botanically ignorant”. Even the 2 Pigeon species, which so love the Laurel species of Gomera that they don’t live anywhere else, didn’t come out to see us! g. When planning our visit to the island, I was interested to note the rediscovery in 1999 of the Gomera Giant Lizard (Gallotia Bravoana) which had apparently, for many years, been thought extinct. The UNESCO Web site states that this is one of a number of “iconic and/or IUCN Redlisted animals and plants found in the property”. Indeed it has even been transferred to this Web site’s “Connection” for WHS containing “critically endangered species”!! Wrong! Garajonay is a cloudy and cool ecosystem not really conducive to reptiles. In fact the lizard is a dry wall species and only exists on the cliffs of La Merica in the Valle Gran Rey – a “Parque Rural” OUTSIDE the Garajonay NP - and well worth visiting. See here. The AB evaluation is of course dated 1986, well before the species was rediscovered, so UNESCO didn’t gets the information which led it to claim that the species is inside the NP from there. The list contains other errors too - e.g the Tenerife lizard (Gallotia galloti) which is also listed as a Garajonay creature isn’t even present on La Gomera!! (Confirmed on its IUCN Red List page). In its 1986 Evaluation IUCN concluded that “Possibilities for extension of the boundaries of the park ……..should also be encouraged”. Well that certainly hasn’t happened yet - instead in 2012 the entire island was declared a World Biosphere Reserve (WBR). The WBR web page correctly claims the Gomera Giant Lizard and makes no mention of its Tenerifean cousin! h. Much of the exposed volcanic and eroded geology of the island, some of which is very fine, lies outside the forested NP – but there is an area of Volcanic Plugs known as Los Roques as you enter the NP from San Sebastian. Another advantage of having ones own transport is the ability to stop at will at the many “Miradores” located at frequent intervals along all the roads and from where the “geology” is better seen. i. Those who are interested in the UNESCO “Masterpieces of Oral and Intangible heritage” list might like to know that there is a plaque and a statue commemorating the inscription of the Silbo Whistled language on that list in 2009, situated just outside the NP at the Mirador de Igualero (a couple of kms S of the Alto). I have been unable to discover why that location was chosen – there wasn’t any explanation. However we did obtain a “whistling demonstration” there from a boy who was visiting with his parents. It appears that Silbo is now a compulsory element within the Gomeran educational curriculum!! The lady guide we spoke to at the VC told us that her son could “converse” in Silbo with her father but that her generation had missed out entirely on learning this Gomeran “speciality”! I have been there several times and find the island magical. However outide the park times are changing and some of Gomera's magic has been lost to development. Go there before it is too late - it is cheap and easy to get to. Living in Europe gives you the opportunity to take a cheap stand by flight to Teneriffe, Canary Islands. Catch a boat to La Gomera, where you can rent a house or stay at the camp site in El Cedro. Bus #1 from San Sebastian travels 5 times a day through the park. Pajarito is the most convenient stop. Volcanic plugs: Roque de Agando, Roque de la Zarcita and Roque de Ojila. Miocene: It arose about 10-12 million years ago, when huge blocks of the oceanic crust emerged from the ocean floor and different volcanic episodes increased its size. Viewable from another WHS: The southern slopes of Garajonay NP are visible from the Teide peak but also from many locations within the Western part of Teide NP.